Like everyone else, when I think of tattoos, a lot of different images and ideas comes to mind. What does not immediately spring to mind however, is cancer. I’m also going to venture to guess that cancer doesn’t crack your own personal list of top ten ideas that spring to mind at the mention of tattoo. In the past here on Tattoo Blog, I’ve written about how breast cancer survivors sometimes get tattoos to cover their mastectomy scars. In a way then, cancer isn’t exactly unheard of in relation to tattoo. Still, it’s not quite your typical union. This article, however, makes a case for at least giving a little more thought to cancer whenever you’re planning on getting a new tattoo. Doctor Nicolas Kluger is a Finnish dermatologist who has done numerous scientific studies on tattoos and their effects on human beings. The most recent issue that concerns him is the relation between melanoma and tattoos. Before you get too concerned, don’t worry – Kluger has found no evidence of skin cancer being more common in people who are tattooed. What he has discovered is that tattoos can make it hard for doctors to detect the odd, misshapen moles on the human body that are potential indicators of skin cancer. ‘…Kluger, a dermatologist who is working on a PhD at the University of Helsinki, agrees that tattoos can make it hard to spot what dermatologists call “the ugly ducklings” — the misshapen, mottled moles that are melanoma. I will definitely admit that the concept of tattoos covering up potential cancer causing moles is not something that I had ever thought about before. It makes sense that this could happen and that people should be aware of the issue. But all that being said, it really doesn’t make that much of a difference. Tattooed or not, what it all comes down to is how aware and vigilant a person is with regards to the moles on their bodies. 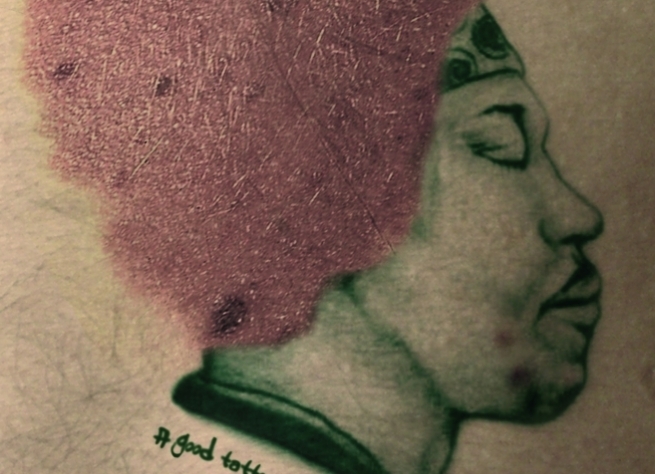 Tattoos might make it difficult to see moles at first glance, but to be perfectly frank, tattooed or not, I don’t know too many people who regularly monitor the moles on their bodies. That in itself is the bigger issue. Still, this article provides a decent heads up for people (like myself) who had never considered the threat of moles hidden amongst tattoos. With summer coming up, it’s always a good idea be aware of the damage that our skin is enduring thanks to too much sun. It’s also worth mentioning that if you’ve got tattoos, sun isn’t their best friend anyway. Always try to keep your artwork out of direct sunlight and if that’s not possible, put some strong sunscreen on it and check those moles! Be aware, my tattooed friends!